NextPress publishes downloadable and print dialogues, essays and books by and between NextNow members and the larger social enterprise/collective intelligence communities. 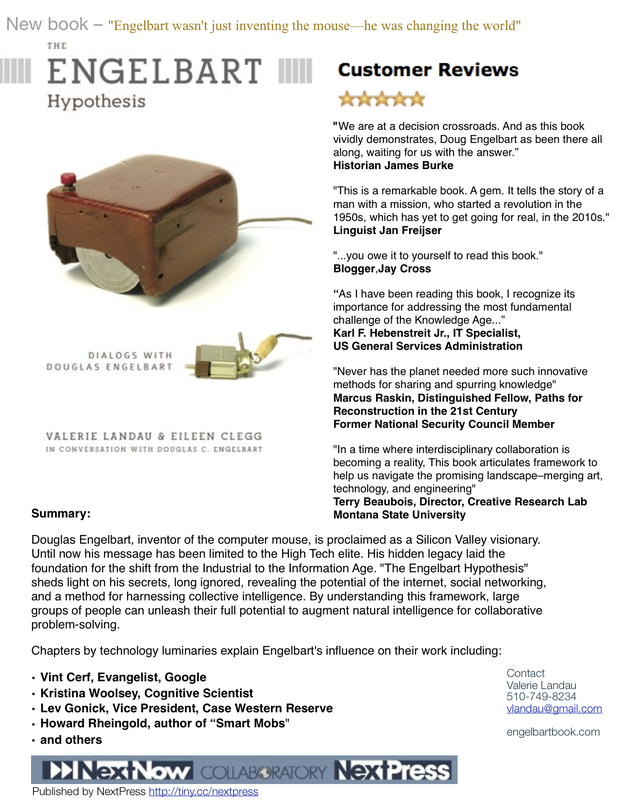 The Engelbart Hypothesis (Evolving Collective Intelligence) is the first NextPress publication by NextNowers Valerie Landau and Eileen Clegg in conversation with Douglas C. Engelbart (December 2008). In July, 2009, we launched V2.0 at The Tech Museum of Innovation. This version integrates contributions to the authors’ thinking from the larger collective intelligence community–including Vint Cerf, Vice President and Chief Internet Evangelist at Google, and Howard Reingold, author of Smart Mobs–as edited by a panel of experts, and represents the “living” nature of the work. Douglas Engelbart, inventor of the computer mouse, is proclaimed as a Silicon Valley visionary. Until now his message has been limited to the High Tech elite. His hidden legacy lies with his ideas that laid the foundation for the shift from the Industrial to the Information Age. The Engelbart Hypothesis clearly articulates his message for the first time in 50 years–– shedding light on the secrets long ignored about the potential of the internet, social networking, and a method for harnessing collective intelligence. By understanding this framework, large groups of people can unleash their full potential to augment natural intelligence for collaborative problem-solving.